This is a collection of the best political WordPress themes for politicians, political candidates, political parties, and political campaigns. Politics can be a difficult and dirty business (just look at the latest US election) but that doesn’t mean your political website needs to be dodgy. These premium political WordPress themes will allow you to have a professional website where you can clearly present your policies, outline who you are and what you stand for, list your achievements, accept donations, link to your other social media profiles and more. WordPress is an awesome free and open source web publishing platform, and the premium themes below are all very reasonably priced. Together they allow you to build a nice website quickly and more importantly cheaply so you can stop wasting at least some of the tax payer’s money! 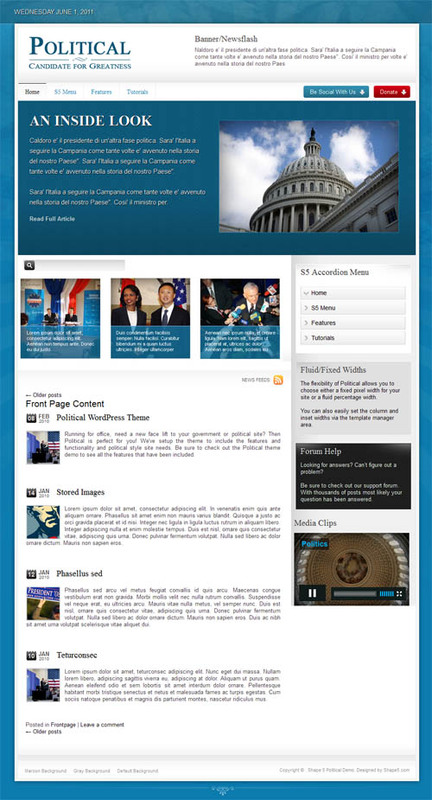 The Political Press WordPress theme is designed for politics related websites and blogs. It’s got a purpose built modern design which is built on Twitter Bootstrap 3.0 and has a mobile friendly responsive design. Some of the other key features include: 4 colour skin, extensive theme options panel, gallery templates, calendar and events support, WP email capture plugin support, meta boxes, biography template, testimonials widget, background customizer, various shortcodes and more. 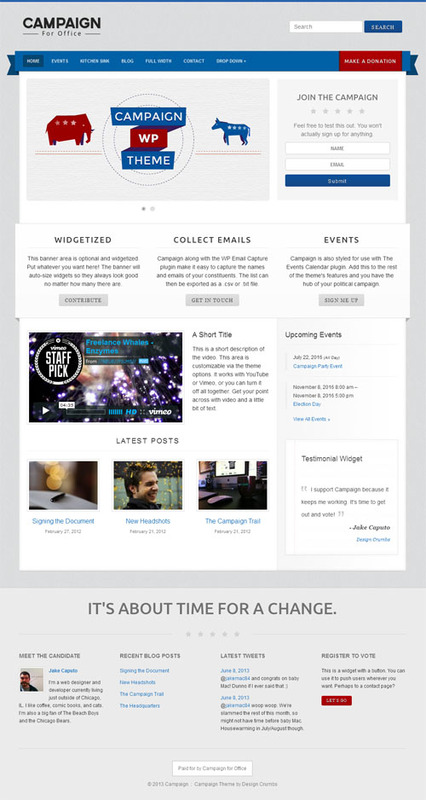 Candidate is a premium WordPress theme specifically designed for politicians and public figures. The theme has a flexible design inspired by the modern political arena and is suitable for any political persuasion or social issue, from serious campaign presentation to more grass roots movements. Features include an astounding 50,000 possible layouts, 19 page templates, 6 custom post types, Google fonts, custom widgets, and WooCommerce ecommerce integration. 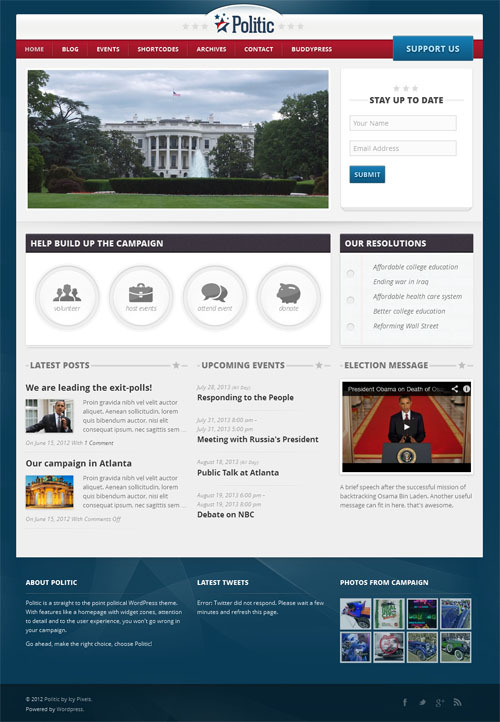 Politic is a unique and professional looking campaign and political WordPress theme. The theme has a strong focus on user experience, usability and beautiful typography and is designed to make you look professional, stand out and come across as a trusted candidate for the people. The theme has a fully widgetzied homepage (drag and drop) with various widget zones you can fill with any content you wish. It is BuddyPress ready so you can create your own social circle to network with people, and includes unique styling for the Events and WP Email Capture plugins. Some of the other features include: unlimited sidebars, post formats support, custom backgrounds, theme options panel, shortcodes (for alerts, tabs, toggles, columns, buttons etc) and more. Politician is a clean and modern political WordPress theme that is mobile ready with a responsive layout. The theme has a fresh flat design, clean edges and elegant typography for a modern and professional website. It has a responsive design so the layout automatically adapts to any screen size allowing it to display perfectly on iPhones, iPads and all other mobile devices. Some of the other features include: 6 colour variations, custom shortcodes, sortable gallery page, 2 news page layouts, localisation ready and more. Campaign is a mobile ready political WordPress theme that’s made to help you win in your political race and be the hub of your campaign. The premium theme supports the WP Email Capture plugin (both the free and premium versions) so you can collect names and emails of your constituents, and the Events Calendar plugin to display all of your upcoming events. An easy to set up donation button is included in the header so you can collect donations for your campaign or party. Campaign also has a fully responsive design is its mobile ready and works on all mobile devices (iPhone, iPad, Android etc). Some of the other features include 4 colour schemes, 2 content layout options, boxed or full width body layouts, homepage slider, video functionality, custom widgets and more. Politico is a premier political WordPress theme ideal for political campaign websites. The theme features a prominent slider which is great for drawing attention to important issues or promoting a candidate into office, a customisable donation button, election countdown timer, easy logo uploader, unlimited banner colours, super easy admin options panel and more. Political is a premium WordPress theme from Shape5 designed for government or political websites. The theme features 5 different menu systems, custom background image, 31 widget positions and 9 styles, fluid or fixed layouts and more. Parlament is political WordPress theme with a clean, bold and modern design. The theme is also mobile responsive and retina ready. It has a flexible design built with a focus on user experience, usability and performance – everything a government is usually not. Parlament is also built with HTML5 and has some nice CSS3 transitions and parallax animations. Some of the other key features include: Aqua Page Builder which allows you to create your own pages with drag and drop, events calendar, 4 hero section types (image with page title, image only, page title only, slider), unlimited colour options, donation button, WordPress theme Customizer (no bloated options panel), light and slideshows, custom widgets and widget areas, translation ready and more.